Kirk Bell July 23, 2018 Comment Now! Getting behind the wheel of the Lamborghini Huracán Performante Spyder is like knowing the secret handshake for an exclusive club. You have to be able to afford the price of entry, know the strange rituals to simply operate the car, and understand the dark art of the ALA active aerodynamics system. Lamborghini has invited me into that club for a day and a half. The venue is the Solage Resort in Napa Valley, where I am given the keys to a $300,000 Lamborghini. To start the Huracán Performante Spyder, I must first put a foot on the brake pedal, flip up the red latch on the center console, and press the Start/Stop button beneath it. To put it in gear, press the M button behind that red latch then pull the right side steering wheel paddle to engage first gear. Want automatic mode? Press that M button again and an A pops up next to the gear indicator in the digital gauge cluster. It’s not like throwing your Camry into Drive. I can’t swing an empty wine bottle without hitting twisty, scenic roads in this part of the country, and that’s ideal for this Lambo. I drop the top—a simple matter of pressing a button on the center console and waiting for 17 seconds—and head out on the first of two jaunts in wine country. With the top down, the midship-mounted 5.2-liter V-10 sounds like a passenger in the non-existent rear seat. In Strada (Italian for street) mode, the engine is reserved, burbling quietly to itself. When I put it in Sport or Corsa, though, the engine takes on a deeper, richer, much louder note. In any mode the V-10 will do whatever I tell it to. When I go easy on the throttle, the Lambo is happy to take me for a relaxed drive through wine country. When I dig deep with my right foot, though....violence! The V-10 barks and yawps and the sound rises by about 30 decibels as it winds all the way to its 8,500 rpm redline. My neck snaps back and I become one with the Alcantara sport seat as rows of grapevines flash by in a blur. 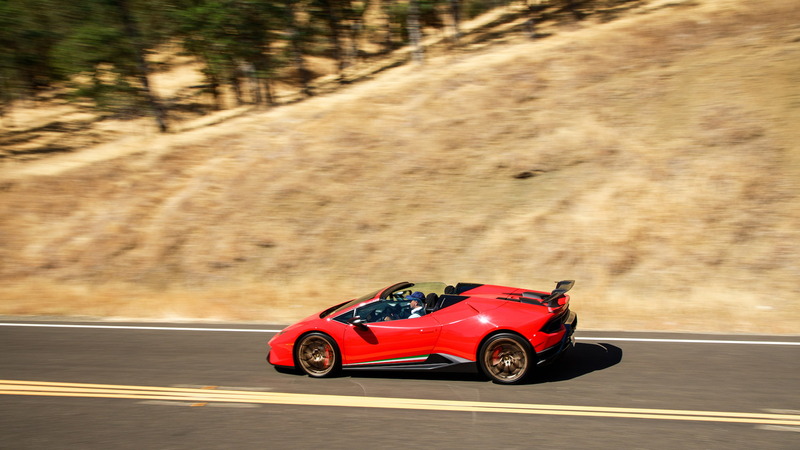 The 0-62 mph blast takes just 3.1 seconds and the Performante Spyder can reach a top speed of 202 mph. A top-down top-speed run is a sure formula for cool racing hair or premature baldness. I can’t achieve the former and have already experienced the latter. 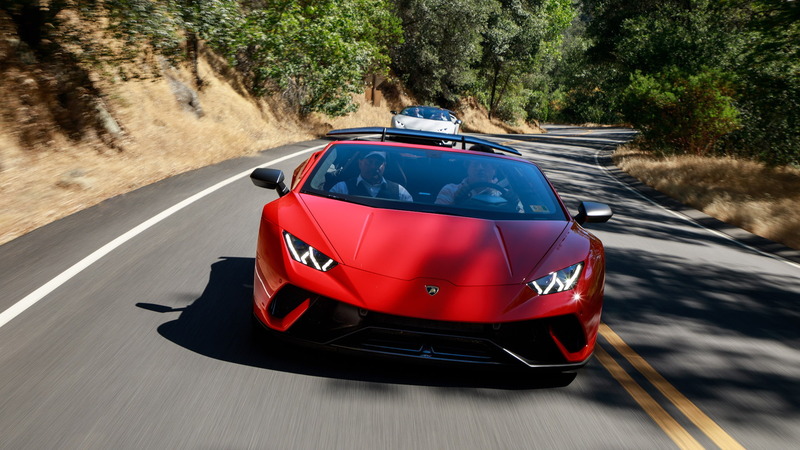 The V-10 cranks out 640 horsepower, with its max all the way up at 8,000 rpm, and 442 pound-feet of torque at an also-high 6,500 rpm, numbers that best the standard Huracán by 30 and 44, respectively. A new air intake system derived from racing and reduced exhaust backpressure add the extra power. The 7-speed dual-clutch transmission (also optimized for the extra power) upshifts almost as quickly as I can click the right-side shift paddle. That paddle is made of carbon fiber, mounted to the steering column, and about six inches long. I pull on the left-side paddle for downshifts, which are accompanied by a “whoom” from the V-10 followed by a series of intoxicating pops and crackles that can range from a mild “pop pop pop” to full-on shotgun blasts. Rev-matching also means the downshifts are smooth so they don’t upset the car’s balance as it enters corners. 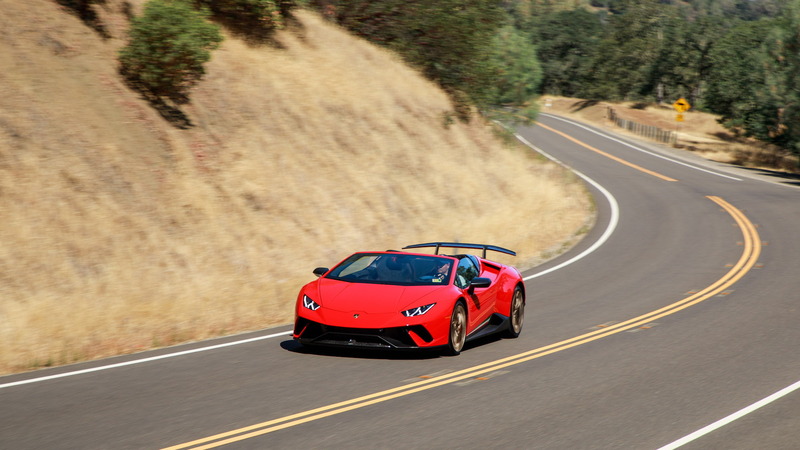 The coupe version of the Performante is famously the car that, for a while, held the Nürburgring Nordschleife street-legal production-car lap record, as well as eight other track records, due in no small part to the Aerodynamica Lamborghini Attiva (ALA) system. That translates to Aerodynamics Lamborghini Active, but it’s best to simply think of it as active aerodynamics. The ALA system is a pretty ingenious bit of Italian wizardry. The most noticeable element is the big rear wing, which looks like a fat pi sign in the rearview mirror. Even though the system is active, the wing is static. It doesn’t move up and down to give or take away downforce, and it doesn’t tilt to act as an airbrake. Instead, it’s hollow, and the active element is the air that flows through it. Intakes in the engine cover feed air to flaps at the base of the rear wing and the system and driving mode determine if and when air will flow through the supports and out the vertical wing. With the flaps closed, the wing provides 750 percent more vertical downforce in high-speed corners than a car without a wing. With the flaps open, the air that comes out from beneath the horizontal plane negates the effect of the wing, making it seem like the wing isn’t there at all. But Lamborghini doesn’t stop there. The wing can be used for aero vectoring. In a left turn, for instance, the left flap can close while the right flap opens, taking the downforce off the outside of the car and keeping that inside rear tire planted. Lamborghini says this provides sharper cornering with less steering angle. An active front wing has a flap that opens and closes via an electric motor. The position of the front wing balances the downforce created by the rear wing. The flaps at both ends can open or close in a half second. All of these components are made from forged carbon fiber. Cheaper to produce than woven carbon fiber, the forged variety is composed of chopped bits of carbon fiber that are suspended in a resin, pressed in a mold, and cured in a heating process. This allows the finished parts to be thinner and formed into more complex shapes than standard carbon fiber. The process is also used for the back bumper engine cover, and interior trim. Overall, Lamborghini saves 77 pounds versus the Huracán Spyder by using forged carbon fiber in the Performante. Lamborghini includes a small screen at the base of the center stack that shows when the ALA system is working, when it’s off, and when aero vectoring is in effect. Even at low speeds, I see aero vectoring at work. I can’t feel the effect on these winding roads, but I can say that the car is stable, planted, and flat through corners. The 20-inch Pirelli P Zero Corsa tires—245/30s up front 305/30s out back—also provide immense grip. The Alcantara-covered steering wheel feels great in my hands, and a red line at 12 o’clock is a performance feature to remind drivers where dead center is during track driving. Moreover, the steering is sharp and quick, with a stable on-center feel. The car reacts almost preternaturally to my inputs, and despite the lack of a top, it exhibits no cowl shake. Credit the strength of the hybrid aluminum and carbon-fiber structure. Standard carbon-ceramic brakes arrest momentum on these roads with ease. These are track brakes. They aren’t challenged by wine country. It may have an outlandish performance envelope, but the Huracán Performante Spyder is also livable. The adaptive dampers do a fine job of absorbing the few bumps central California has to offer. The ride is firm for sure, but it isn’t harsh. Why the Huracán Performante Spyder? The extra power and the performance enabled by the active aerodynamics are both well and good. However, most Lamborghini buyers who will benefit from those upgrades will choose the coupe and take their cars to the track. You buy the Performante Spyder because when you are spending well into the six figures for a supercar, you want “the good one,” even if it costs a pretty penny more than the base car. 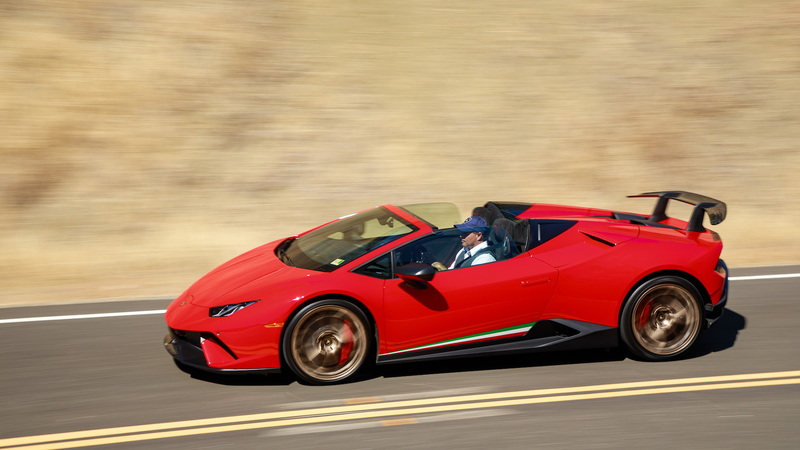 While a standard Huracán Spyder costs $265,695, the Performante starts at $312,554. But for the extra cash you get admission to the Excelsior Suite of an already exclusive club. That’s a pretty great place to be. Believe me. I was there for 36 glorious hours. 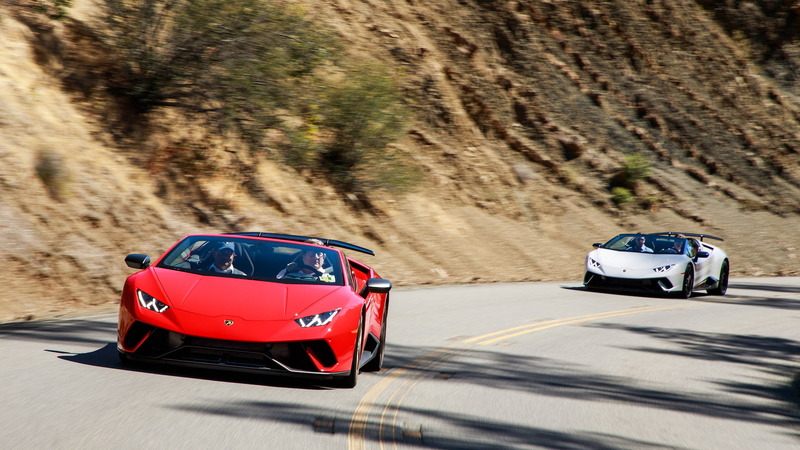 Lamborghini paid for airfare and lodging for Internet Brand Automotive to bring you this first-hand report.